Take a look to see how many things we all take for granted have effectively changed the course of our history … from the creation of credit, email, contact lenses and YouTube, to commercial infant formula, Starbucks, and OPEC. Just think. Without the creation of credit and the fixed-rate mortgage, we might not be homeowners. Without modems, we wouldn’t have the Internet, and without those ubiquitous bar codes, we probably couldn’t have fast check-outs, Amazon or inventory control. Clocking in as disruptive idea #27 is the invention of the 401(k), created in 1978 when President Jimmy Carter signed his name to legislation allowing workers to contribute part of their pay to tax-sheltered accounts. Little did we know it at the time, writes Businessweek writer Evan Applegate, but that drove the first nail in the coffin for workers’ pensions. Corporate America found 401(k)s easier and cheaper to administer. Job hopping workers found them better suited to their itinerant lifestyles. The result? 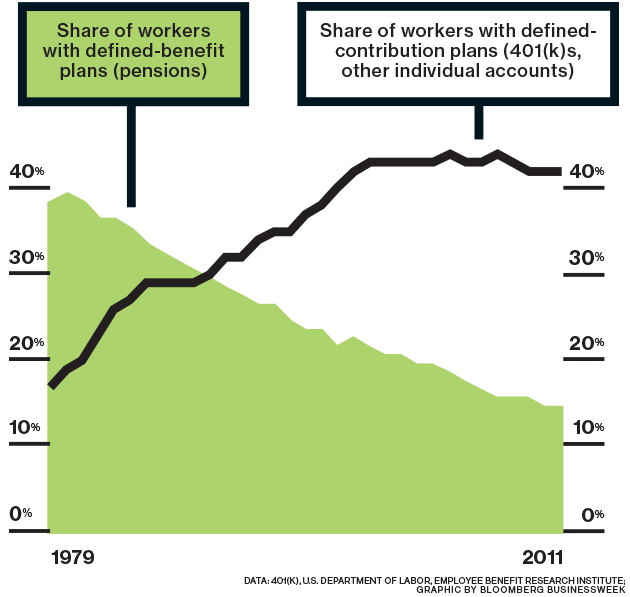 As 401(k)s grew, pensions started into steady decline (see Bloomberg Businessweek’s graphic above). “From 1985 to 2012, the number of Fortune 100 companies offering traditional defined-benefit plans fell from 89 to 11,” writes Applegate. 401(k)s now hold the third-largest amount of retirement assets, after IRAs and government pensions. The Takeaway: Like it or not, you’re now in charge. Your retirement future is squarely in your hands. Save and invest well, you’re in clover. But there’s no more corporate Big Brother to bail you out. It’s the Brave New World of retirement planning.